Below is a list of UPCOMING JOB FAIRS in Soccsksargen or Region 12 from April to December this year as posted on DOLE XII's official website. Mark your calendars and be ready with your documents necessary in applying for a job. 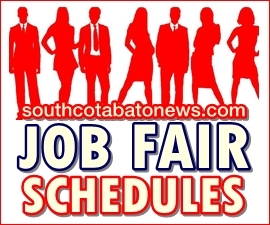 For job hiring and job vacancies in South Cotabato please visit this link or follow South Cotabato News on Twitter for more job fairs and job hiring announcements.